Welcome to Airmass Engineers, Manufacturer and Trader of Pollution Controller and Ventilation Equipments. The company was established in 2000 at Chennai. Our Advanced infrastructural facilities and excellent logistics support make us different from others. High tensile strength and convenient usage help us to grab Clientele like Hinduja Foundation and TTK LIG Limited. We offer a vast range of Industrial Ventilation Systems, Industrial Blowers and Scrubbers. 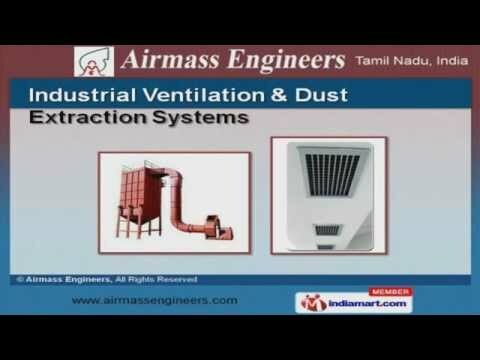 Industrial Ventilation and Dust Extraction Systems are well known for their outstanding performance. Our Acoustic Enclosure and Pulse Jet Dust Collectors are a class apart. We also provide Industrial Blowers and Scrubbers that are acknowledged for their functionality. Fume Collector, Exhaust and Fume Extractors are well known for their durability and reliability. We are offering a top notch quality range of Fume Scrubber, Cyclone Dust Separator and Services of Air Pollution Equipments.